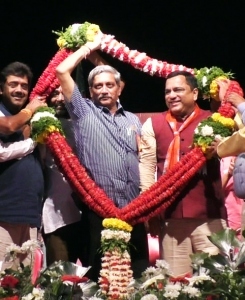 Finally, Defence Minister Manohar Parrikar opened his mouth, to tell where Mauvin Godinho and Pandurang Madkaikar stand now in the BJP, after calling them biggest scamsters in the past. He has also given clean chit to Pandurang Madkaikar in the land purchase scam in which he had ordered police inquiry when he was the CM in 2014. While Mauvin joined the BJP on 16th December, Madkaikar joined today. Both of them resigned as the MLAs as well as from the Congress. Parrikar, who personally welcomed Madkaikar at the BJP headquarters, was grilled by the media during the press briefing. He tried his level best to convince the media how his job was over after recovering Rs 63 crore by the government. “I personally spent around 5 to 10 lakhs from my pocket to fight the case. You didn’t”, he told the media persons. Media also reminded him about the inquiry by anti-corruption branch he had ordered as the CM on 23rd July 2014 in the land purchase of Old Goa. Parrikar, as the CM, had told the House that Madkaikar had purchased the land earmarked for a new police station building for his real estate firm. Stating that this was abusing power since Madkaikar had done it when he was the transport minister, Parrikar had termed it as a clear case of corruption. “I don’t remember all the details since it’s a case which happened six years ago. And you also study the case and ask me questions. I will reply to it later”, he told the media. He also said that the police inquiry is complete and the government would go by what the inquiry report states and take action accordingly. What is wrong in poster? AAP is asking only opinion of Goans. Why BJP CM candidate is scared to face the CM candidate of AAP? This is democracy country and there must be debate between AAP and BJP CM candidate. Congress & BJP are Two sides of the same Coin. BJP never acted against Congress illegal mining of 35 Thousand Corers rupees. Congress never acted against BJP illegal Mopa Airport.